After working within the industry for a number of years Darren Mays, Director of D & M Tankers Ltd took the decision to set up his own business in non-hazardous liquid waste services. Darren identified an opportunity to provide a more customer focused service that is efficient and great value. Being a small company D & M Tankers Ltd can react quickly to customer needs and normally provide a same day service where this is required, this means customers get service and solutions to their problems when they need it saving them valuable time and inconvenience. Additionally pricing is very competitive meaning that you are not paying the cost of a “Corporate” whilst getting the job done when you need it. If you are looking for a quality service at a great cost effective price then contact D & M Tankers on 0116 200 1752 now! D & M Tankers provide private residential customers with a very competitive cesspit and septic tank emptying service, we empty your tanks when convenient to you professionally disposing of the contents, we are a fully licensed carrier giving you the peace of mind that your waste is being disposed of legally and safely. All of our waste is disposed of at fully licensed locations and full details and paperwork are maintained. 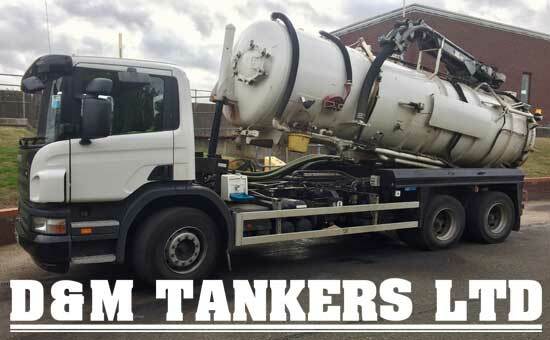 If you are in Leicester or Leicestershire then D & M Tankers will provide you with the best and most effective service if you need your septic tank or cesspit emptying. Once we have completed the first job we agree with you how often you require your cesspit or septic tank emptying and then return to complete the work on a regular basis meaning you don’t need to have to worry about the emptying of your tanks in the future or find a provider to complete the work, we build long lasting relationships with our customers, you can see some of our testimonials by clicking here. Our work is not exclusive to septic tank and cesspit emptying, we also undertake a wide range of Corporate work including Interceptor Emptying, the emptying of Grease traps and as our vehicles are fitted with high pressure jetting equipment we can quickly deal with and eradicate major blockages or problems. D & M Tankers also provide a full and comprehensive CCTV drain survey service enabling you to quickly and efficiently review your drainage system, identify blockages or identify problems meaning that you can resolve problems quickly and accurately.